Enriched with exfoliating jojoba microbeads and bamboo powder, this detox shampoo containing peppermint* removes impurities and build-up due to hair care products and pollution, and brings a feeling of freshness from the root of the hair. 100% of the people who tested it said that the dry and oily flakes in hair were eliminated and their appearance delayed**. The scalp is balanced: oil does not build back up as fast in greasy hair, and dry scalps are soothed for greater comfort. 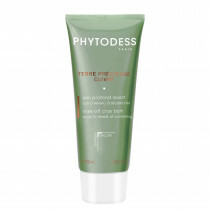 * Peppermint harvested in France and grown in line with environmentally-friendly farming practices. ** Use test conducted on 10 people stating they had a dry scalp and 12 stating they had an oily scalp for 21 days – Findings based on self-assessment." Jojoba microbeads, bamboo powder: Exfoliate the scalp and eliminates impurities and residues of styling products, flakes, pollution. Celery extract: Balances and soothes the scalp, delays the appearance of flakes. Microbilles de jojoba, poudre de bambou : Exfolient le cuir chevelu, gomment les impuretés, résidus de produits coiffants, pellicules, pollution. Extrait de menthe poivrée : Source d’antioxydants. Extrait de céleri : Équilibre et apaise le cuir chevelu, retarde l’apparition des pellicules. Menthol : Apporte une sensation de fraîcheur et de légèreté dès la racine. Apply generously to wet scalp, work into a lather and rinse. 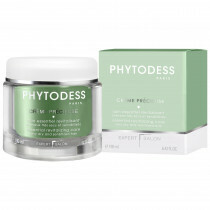 Follow with a PHYTODESS hair care product for lengths and ends.